As I write this today the snow continues to fall in the Des Moines metro area. I am not a big fan of winter and even less a fan of snow. However has we all know we are not in control of the weather only how we react to it. That’s not only true with weather but pretty much a lot of circumstances we encounter. As law enforcement officers we have to deal with the choices and behaviors people make on every shift. Whether it be the traffic violator, shoplifter, intoxicated or impaired person, or the a victim of a crime, the expectation is that when the law enforcement officer shows up he or she will handle it and handle it correctly, professionally and legally. The majority of the time that is how things play out. The issue that tends to be forgotten is what effects were left as a result of that interaction. Not only the effects on the citizens but also the officer. Most likely that will be the only interaction of that type the citizen will have that day or night, however the law enforcement officers go right on to the next interaction and depending on how busy of shift could have several some of which may be back to back. That can wear on an officer if they don’t have an adequate set of coping skills will negatively affect their health and wellbeing. We all take care of our cars, trucks and SUVS because they are a substantial investment and lack of care will decrease the life of that vehicle which in turn will cause us to replace it earlier than anticipated, which relates to spending money we may not have budgeted. The crazy thing is that take better care and give more attention to our vehicles than we do with our own physical and mental fitness. We can replace a vehicle but we only get one body and it comes with a pretty complex and resilient set of parts. It’s a new year and that is a time when people make lists of goals, resolutions and promises to themselves. My challenge to you as law enforcement officers is that you make a commitment to be honest with yourself and that this is the year you make the lifestyle changes that you need to for your health. That you work to develop a toolbox of coping mechanisms that will help you deal with the mental stresses of being a law enforcement officer. 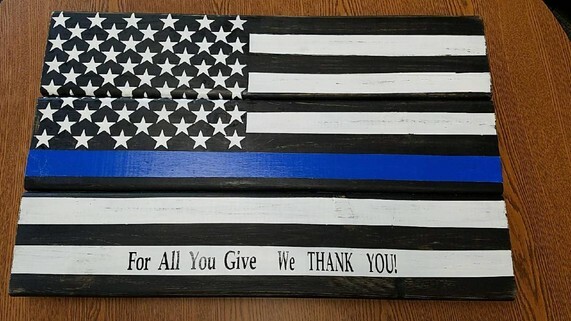 There is no reason we can’t start to reverse the trends and statistics that are showing law enforcement officers dying younger and having a higher suicide rate than the general public, if we come to understand and acknowledge we have to work a little harder to get through all the stress and negativity we deal with every shift. Find a training course such as Blue Courage to steer you in that direction. Establish an accountability partner you trust and can share things with, read and learn more about coping skills and I am confident that 2019 will be a great year. Thank you for your service and dedication and always BE SAFE! 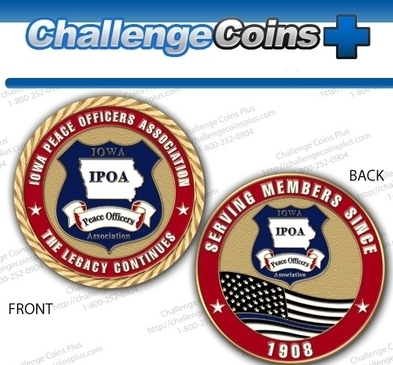 The IPOA Challenge Coin is now available from any of your Board Members or by contacting the Sec.-Treasurer of the IPOA. The Iowa Association of Chiefs of Police and Peace Officers became the first statewide organization to represent Law Enforcement Officer serving the State of Iowa in 1908. A.G. (John) Miller of the Des Moines Police Department became the first President. From humble beginnings almost 108 years ago the "Chief's" Association has grown to become one of the largest professional Law Enforcement Associations in the state. We presently have approximately 1800 members or our organization. Our membership is open to "ALL" certified Peace Officers in the State of Iowa. Our membership includes City Officers of all ranks, Sheriffs and Deputies, State Troopers, IDOT Officers, Federal & State Agents from the FBI and DCI. Today we are known as the Iowa Peace Officers Association. At the 2010 Conference in April, the members present voted to change the name of our association. The reason for this proposal from the Board had been explained in previous Iowa Law Enforcement Issue. We are now known as the: Iowa Peace Officers Association. We are very proud to have been known as the Iowa Chiefs of Police and Peace Officers Assn. for the past 104 years. The selection of our new name really represents who we are, Certified Peace Officers in Iowa from all branches of Law Enforcement. We do believe this was the right decision at the right time. We will continue to serve all of Iowa in our future efforts. Our Membership remains the same and includes Police Chiefs, Sheriffs, Officers, Deputies, State & Federal Officers from throughout Iowa. Take time to view our Past Presidents section and see some of our History. Mailing Address: Iowa Peace Officers Assn. We will continue to use the old address to direct you to this site for the near future, please change and bookmark the new address in your favorites section. Thanks for visiting our new website, you will find contact information for our Board Members and current information for the association. It is a pleasure to serve you, please forward information and comments that may enhance our website.